Good behavior should be rewarded, but often training treats are empty-calorie treats with no nutritive value and include undesirable ingredients. At Life's Abundance, we strongly believe that you should only feed treats that can help to support overall health. Tasty Rewards are wholesome nutritional treats made from New Zealand-raised lamb and chicken. They’re loaded with proteins, minerals, vitamins and essential fatty acids. And, like all of our foods, supplements and treats, you’ll find no added artificial preservatives or colors. With Tasty Rewards Nutritional Treats, discipline can be delicious! Each 4 oz. bag contains approximately 70 treats and each 16 oz. bag contains approximately 280 treats. Lamb, Chicken, Ground Brown Rice, Dried Chicory Root, Lecithin, Ground Pumpkin Seeds, Salt, Mixed Tocopherols (preservative), Vitamin B12 Supplement. Metabolizable Energy (ME) = 3,872 kcal/kg, 3.9 Calories (kcals) per 1 g treat. Feed as a reward for good behavior or as a delicious, healthy snack. Keep package closed and store at room temperature away from heat or direct sunlight. My dachshunds love them so much that they try to steal them from each other. It good for our dogs and is small it can fit in ur pocket. My dogs LOVE these and the Turkey Berry treats! I can get them to do anything I want for this reward! All the dogs that I train with love these treats. I am always looking for a great dog treat! My dogs went totally bonkers over this one. We will definitely be purchasing this one again. 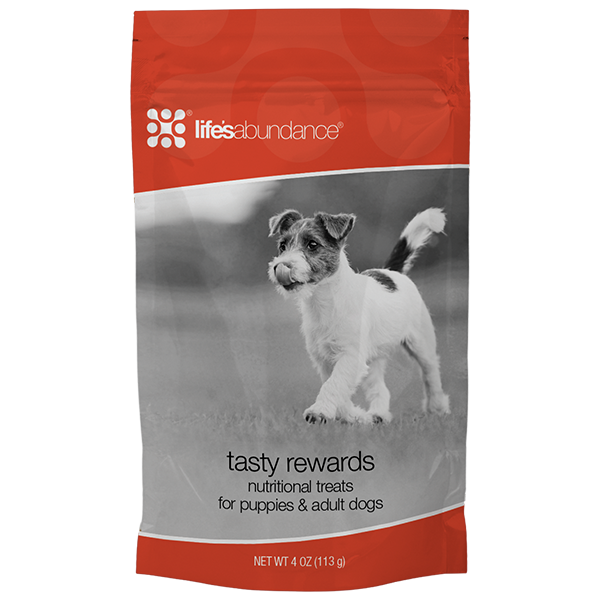 Tasty Rewards are great for training puppies and older dogs alike. And are a great value. My dogs love these treats and will do anything to have one. My puppies actually listen and obey commands when given these treats. Treats are just the right size for both puppies and adults. Love them!! These wholesome nutritional treats are great for training and the dogs love them! Perfect training treats .. My dog loves them ! The perfect, healthy training treat! It feels so good to feed our pups a healthy snack that they love, love, love! My two Bichons Frises love the Tasty Rewards. We use these for rewards during Rally training. We have shared some of these with others at Rally practice and all the dogs love them. My dogs love these training rewards! My pup loves these, I use them after walks. Great treats that are health and my dogs love!!! These are my new go to for training treats (along with the turkey and berry chews). They break apart very easily to make just the right size for training new puppies and the dogs love them as much as I do. My Chloe loves the Tasty Rewards! She will do all her tricks in order to get them! My 3 pups love these treats! I love it because I know it's safe for them to eat! These are great for use during training. Can be broken down to smaller bites so I get a big bang for the buck. Plus the pooches love them. Treats are ok I think they are expensive. Excellent treats for training!! My dogs will go sit by the bag waiting for a treat they absolutely love them! These are soft treats that are great to use when training your dog. Also great for smaller dogs since you can make them the right size for smaller mouths. My dog loves them! Dogs that are "picky" have eaten these treats with excitement. My dogs love these and I love that you can break them into smaller pieces for small dogs! I have used this as a training reward as well as for baiting in the show ring. The furkids love them! Excellent as a training treat or even when you want your dog to think they are getting more treats than they are! Great for rewards during training! Easy to break into smaller pieces. Using these to train my new puppy, and they are excellent! Feels good knowing that they are nutritious as well as delicious. These are a must have for bribing the dogs into their kennels. Works like a charm. Our dogs all love these tasty rewards! Haven't seen a dog turn these tastes rewards down in the 11 years I have been a pet sitter. Our dogs love these treats. Very happy with the qualities of the treats! My dog loves these treats! I have two 8 mos old golden retriever pups that are going through obedience classes so these make terrific treats. I just break them in half and they are firm enough to stay as a nibble. They luv them! Our Maltese and standard Poodle will do anything for one of these. My puppies and puppy buyers love these. These are easy to break up into smaller pieces to make theM last. Most dogs prefer these over many training treats on the market. Mine love them. I use the training treats for my adults and puppies. I like the fact that they break into small pieces for training. We love these treats and love that we can get them in a large bag. All 3 of my dogs love this treat! Our beloved little Maltese Loves her treats. They are so Healthy, not like what you purchase at the stores. I can make a shy and timid puppy jump on the grooming table. They love this treat so much. Not only tasty, but also it has great nutritional value for dogs. My customers love this treat for their new puppies as well as their seniors... it is small and just enough! These are great training treats. The dogs love them and work attentively for them. 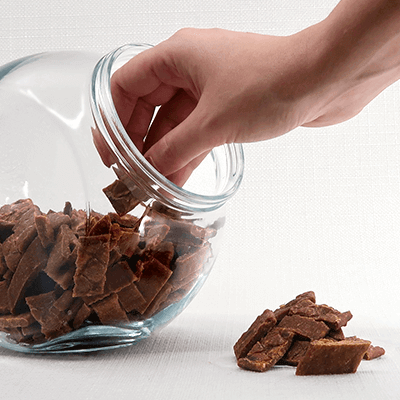 They are easy to break into smaller treats for extra rewards. They are firm enough to carry a bunch in my pocket without breaking up or crumbling. And I know the ingredients are food grade, so I'm not using "junk food" treats while training. Our dogs work quite happily for these treats, and it is wonderful to give them as rewards knowing they are a quality food grade treat, not like junk food for dogs. They hold up well to taking a little stash in the pocket for walks and break easily into smaller pieces to make multiple rewards out of one small wafer. I keep them on hand at all times. Use these tasty treats on my daily work with my girls. They love them! Best little training bites. You can break them into smaller bites too which makes it nice. Love these training treats!! Dogs love them and they are the perfect size in you hand while training. Stay fresh longer than other treats. The dog's love these and they are healthy for them. This is a winner as far as I'm concerned!! My dog gives me his full attention with these handy tidbits in my pocket, and even the neighbors dogs sniff my pocket and follow me. And best of all, they're good for him! Our adult rough collies LOVE these treats. They hear the bag opening and come immediately. They will do ANYTHING for these treats. The dogs I sit for absolutely love these. Smaller size is perfect for training. We break each piece into threes or fours to last a little longer. We used these to potty train our puppy. They are a hit and a healthy addition. My dogs love them and so do my client dogs. Always fresh! These treats are fabulous! They break easily into small pieces for puppies and small dogs. my dogs and my students dogs love these treats! A little crumbly for training classes and flooring but happy to feed without worrying about 'junk food' treats. My dogs, small and large, go crazy for these! They are their nightly after dinner dessert. My dogs love these treats. They just see the bag and get so excited. Every dog I've given these treats to, love them! My dog loves them and thy are small enough for her to handle. My dogs favorite! I often give these as gifts to friends - have never been disappointed! I use these daily with my dogs as training treats and rewards. They do not like store bought treats, Since they are made by Life's Abundance I never worry about the ingredients. My golden and Chihuahua go nuts for their treats. My pets give this a paws up rating! Yummy training treats and wholesome too. My Westi loves the treats. These treats are awesome! My dogs absolutely love them! Great treats! They last forever and certainly get my dogs attention. These are great healthy training treats that I use with all of my training clients. I'm finding that folks might be very astute at checking the ingredients of their dog's main food often but buy treats with all kinds of scary ingredients. These are non-greasy and break into small pieces for training. They're the best! Puppies love them for show training. Our fur kids love these treats! Our dogs all go nuts for these things! One of our pet's very favorite - and her puppy pals too! Tasty Rewards are so handy to have training puppies and to give when my dogs do something I ask. They are easy to put in a pocket, dont crumble up but are soft and easy to make into smaller pieces if you want. The dogs love them and the fact that they are actually a treat that is healthy with vitamins and minerals in it is a plus!! Love the nice bite size pieces. They work great for potty training a new puppy. These are great for having my dog do tricks. He loves them! This is used for Sunday treats when I have my dogs do there tricks for me. They love to have this. These are great training treats for getting your dog to pay attention in a distracting environment. The best ever.... My dogs flip over these. I put them in a treat ball and dogs play until they are all eaten. Awesome, high value, easy to break into even smaller training treats and come in great packaging with a ziploc top...allowing a stay fresh quality -- if they last long enough! Great treats. I like that you can break into smaller pieces. Works great when needing food treats when showing the dogs. I'm a dog trainer by trade and find this to be a great training tool. Many dogs prefer this over most training treats out there. I know that I don't have to worry about recalls and it making my dogs sick like many of the others out there that have ingredients from China! Id rather pay more for a quality product that I know I can trust. These will always be a best seller. Dogs LOVE these treats. The best little tempters to be good boys and girls you will ever find. They can be broken into tiny bite size for the teacup breeds or kept whole for the large breeds. My dogs will try every trick in the book to get one of these just for being cute! One of my dogs favorites. She will do anything for these treats, including playing the piano. These work great for training rewards. Puppy is very excited to get them so she does work for them. I like using something that is so good for the dog vs. the junk you get locally. These are addictive. Dogs are loving this as a treat. my dogs think this stuff is the BEST treat EVER. They will do anything to get another piece! Works great for training puppies because you can break them into smaller pieces and keep in your pocket without being sticky or stinky :-). My dogs absolutely love these treats!!! These are great little treats! My dogs learned all of their basic commands using these treats as rewards. Now when they see the package come out they automatically sit and lie down to get one. They love them! The dogs will do ANYTHING for one of these--they must be very delicious! And I don't need to worry about the toxic ingredients found in some brands on the shelves. I love these treats for dogs because I can keep in my pocket while walking and they will not break up or mess up my pocket. Great for training and keeping the dog alert to what's next. Dogs love the taste and great size to carry along for rewarding good behavior. I have not found a dog that will refuse these treats. The perfect size for training. These really are perfect for training. They’re also perfect for playing games (like hide-n-seek). I like the fact that these treats have the same kinds of nutritional values (protein, fat, fiber) as excellent food. They dogs don’t know it, but these are real nutrition! The only treat we use. They are great to use as is or easily break them up into smaller pieces in your hand while training. No knife needed. I call this doggie crack as my 5 yorkies will do anything for these treats. I take a lot of photos of them and i just grab the bag and hold it with the camera and they all look and wait for their treats. Excellent training treats!